Why did the seal go? I absolutely loved the seal. Apart from that great work on improving the envelope details. Please do bring back the seal! Nice. The image says "Iteration 2" instead of "Iteration 3" though. Thanks Dan, I made the edit. New feathers are too perfectly ordered, looks like a lizard's skin. I also suggest to shorten the "new feathers" zone. Much better than the original. Although I loved the seal, it gave the icon more private feeling and mail of any kind is better when it is private. Is it possible to make the envelope more grey-white (like Iteration 1), but to keep the details of Iteration 3? I must say that the icon change really reflects the change between TB2 and TB3! Many TB users also have Lightning installed. May I suggest that the "@" in the seal be replaced by a lightning zig-zag? I'd agree on the unnatural perfection. The overall look is a bit too smooth. I'd welcome the feathers to bulge a bit above the wing borders (mostly external, but it wouldn't hurt on the internal edge either). Something between the old punk look with feathers out of control, and the new smooth look. But what I miss more is the shininess and saturation of the FF3.5 logo. The current iteration looks too washed out for me, somehow sad and non-dynamic. Also, the envelope looks a bit empty for its size. Can't think of anything to add, though. Adding a post stamp (inked rubber) reminds me of Bat and turning the envelope around and adding a paper stamp would remind me of iMail or something. But it could use some detail as the FF-like gloss or the "continent map" on its globe. I liked it a bit better with the red @-seal. While you can argue that not much will be left of it in a 16×16 size, it added a nice colorful spot to the center in the otherwise now more pale envelope. other than that, really great work! 1) The right wing still needs work. Iteration 2 was better in that respect — in iteration 3, they don't really feel right (a bit too regular and too symmetrical; they need to be curved in one direction). The right wing should be more "joined" with the body. 2) A bit more lighting and dimension, especially for the right wing. 3) The @ seal should be brought back. I like this version; it feels brighter and more modern, and the distinction between this iteration and the current icon feels like it's a good amount of difference. I completely agree with Mirek2. And I agree with deb00t, when he speaks about lost dynamics. When I have more free time (tomorrow? ), I will make two additional drawings. First will be about original logo dynamics, and second will be about some remaining changes, which should be done to make this logo perfect (probably, I will draw here my own version of finished logo). There are a lot of good comments above that I really agree with (accept about the @, I don't like that). But I would like to add that the connection between the body and the wing should be less hard. Maybe a few feathers to merge the join better. I still like my original idea of incorporating orange in the logo; solidifies the connection to Firefox and visually looks attractive. Really coming along well. I would try to increase the range of contrast in the feathers on the wings, with lighter feathers on top and darker feathers on the bottom, and also try to overlap them and stagger them a bit with shadows to add a little more detail and dimension. In the previous icon and in these new iterations the feathers on the wings all seem to line up in a series of rows, which doesn't seem all that natural. The staggering of feathers that is starting to show up at the top of the head looks good. Personally I really liked the crisp white envelope from iteration 1, but this envelope also looks good, especially with hte increased detail (just a bit more aged, but not as aged as the very yellow envelope in the original icon). I would personally go for a more reflective surface on the envelope as well, but that's likely a debatable decision. Are you going to have Anthony create a similar envelope icon for file type associations in the OS? The smooth indentation for the eye looks absolutely fantastic! > Are you going to have Anthony create a similar envelope icon for file type associations in the OS? A good .eml icon would be a huge boon! I have also discovered, that new "envelope" icon should be used not only for .EML files, but for "mailto:" internet shortcuts in Windows. Of course, we definitely NEED such "envelope" icon! P.S. Nice to hear that Alex Faaborg is alive :), and watching Thunderbird logo creation process. 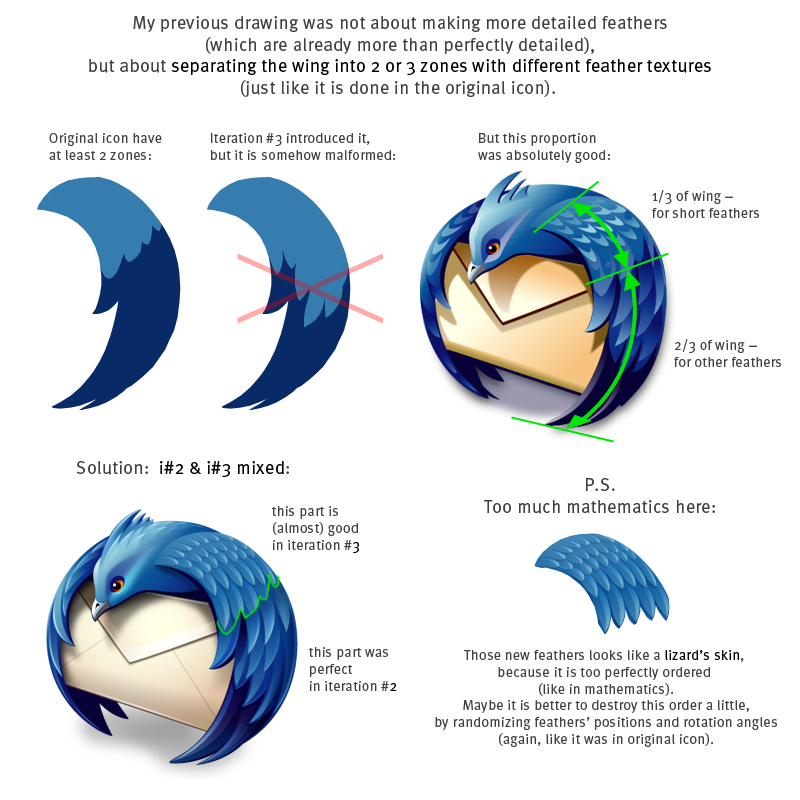 Anyway, Mirek2 mentioned that the wing could be more connected to the body, and I came to think about this as well. It worked great on the older, less detailed logo, but tend to look slightly glued on on this more detailed version. Other than that, amazing work on this so far! WOW! that is way cool! “The icon is being rendered by Anthony Piraino at the Iconfactory. This is a better and more defined icon. What is the website of the person who made this? The new thunderbird icon is really cool. I really like it. It's very refreshing. Is it the final version? I vote that the new Thunderbird icon looks a little too gray. Anyone with me? The envelope just looks a little "sickly", especially when scaled down on the Windows 7 taskbar. Maybe it's just because he sits between the Firefox and Outlook icons, which are bright orange and bright yellow, respectively. I think most "professional" icon designers have tried to make their colors cheery and "pop", and thus, sadly, I think the Thunderbird icon has to join the foray. That said, the overall, new, detailed design is rather attractive! Cool icon for such a great open source software. I like it! Hey, what a great Icon! That is really looking cool! Love that very creative icon you made! Your changes are very nice !!!!! Fine alterations, specifically the envelope is quite nice now. Very Nice icon. Good job! I like the new changes done and it looks better now. But I I think it will be much better to put back the light shadow on the head. It makes it more real.